Carlos Iván Beltrán (Spanish pronunciation: [ˈkaɾloz βelˈtɾan]; born April 24, 1977) is a Puerto Rican former professional baseball outfielder. He played in Major League Baseball (MLB) from 1998 to 2017 for the Kansas City Royals, Houston Astros, New York Mets, San Francisco Giants, St. Louis Cardinals, New York Yankees, and Texas Rangers. A right-handed thrower and switch hitter, Beltrán stands 6 feet 1 inch (1.85 m) tall and weighs 215 pounds (98 kg). Beltrán was the American League (AL) Rookie of the Year in 1999 while with the Royals. He was named to nine MLB All-Star Games, and won three Gold Glove Awards and two Silver Slugger Awards. Beltrán was the fifth player to reach both 400 home runs and 300 stolen bases and just the fourth switch hitter with 400 home runs. He is also a member of the 30–30 club, as he has hit 30 home runs and stolen 30 bases in the same season. Beltrán retired after the 2017 season, winning a World Series title with the Houston Astros. Beltrán is among the best all-time statistical hitters in postseason games, which has earned him nicknames such as "the new Mr. October", "Mr. October, Jr.", "Señor Octubre", and "the real Mr. October" from the media. He broke the 1.000 OPS mark in four different playoff series. Beltrán also had a 100% stolen base percentage (11-for-11) during the playoffs, which are the most stolen bases without being caught. In his youth, Beltrán excelled in many sports, with volleyball and baseball being his favorites. At his father's urging, he gave up volleyball to concentrate on baseball when he was seventeen. He was originally a shortstop before moving to the outfield. He graduated from Fernando Callejo High School in 1995. The Kansas City Royals selected Beltrán in the second round of the 1995 Major League Baseball draft. After he signed, the Royals assigned him to the Gulf Coast Royals of the Rookie-level Gulf Coast League. Originally only hitting right-handed, he batted .276 with no home runs. During the off season, Beltrán taught himself to hit left-handed, with advice from New York Yankees outfielder Bernie Williams and then-Royals minor league coach Kevin Long. In 1996, he played for the Spokane Indians of the Class A-Short Season Northwest League, and the Lansing Lugnuts of the Class A Midwest League. In 1997 he spent the entire season playing for the Wilmington Blue Rocks of the Class A-Advanced Carolina League. He began the 1998 season with Wilmington, and received a promotion to the Wichita Wranglers of the Class AA Texas League. Beltrán made his Major League debut on September 14, 1998, playing 15 games. Unlike many players, he never played in Triple-A, the Omaha team. In 14 games of the 1998 baseball year, Beltrán got 16 hits, 5 doubles, 3 triples, and 7 RBIs with a .276 batting average during his time in the Majors. By 1999, he won the job as the Royals' starting center fielder and leadoff hitter. He displayed significant power by midsummer, and was moved to the #3 slot in the batting order. Beltrán won the American League Rookie of the Year award, batting .293 with 22 home runs, 108 runs batted in (RBIs) and 27 stolen bases in 156 games played. On September 27, 1999, Beltrán made the final out at Tiger Stadium striking out against relief pitcher Todd Jones as the Detroit Tigers beat the Royals 8–2. In the first 69 games of the 2004 season, Beltrán batted .278 with 15 homers, 51 RBI, and 14 stolen bases. Playing for a small market club and represented by agent Scott Boras, Beltrán endured trade rumors through the 2003 and 2004 seasons. As the end of his contract neared, the two sides failed to negotiate a longterm deal. Following an interleague doubleheader loss to the last-place Montreal Expos, Royals' general manager Allard Baird informed reporters that he was preparing to dismantle the team and rebuild it for the 2005 season. In 2004 he led the major leagues in power-speed number (39.9). While still a Royal, Beltrán had been selected as an AL starting outfielder for the 2004 All-Star Game. After being traded to the Astros, Beltrán was ruled ineligible for the AL roster and was not listed on the NL roster. After NL starter Ken Griffey, Jr., went on the disabled list, Beltrán was named his substitute. For the rest of the 2004 season with the Astros, Beltrán played 90 games batting .258 with 23 home runs, 53 RBI, and 28 stolen bases. Overall in 2004 combined with both teams he played for, Beltrán played 159 total games with a .267 batting average, 38 home runs, 42 stolen bases, 104 RBI, and 121 runs scored. In the 2004 MLB playoffs, Beltrán tied Barry Bonds' single postseason-record with eight home runs. He hit one in each of the first four games of the National League Championship Series (NLCS) against the St. Louis Cardinals, including the game-winner in Game 4. Counting his two home-run performance in Game 5 of the previous playoff round in the National League Division Series (NLDS) against the Atlanta Braves, Beltrán clubbed at least one home run in a record-setting five consecutive postseason games, outnumbered only by Daniel Murphy's home runs in six consecutive postseason games in 2015. In 12 games in the 2004 playoffs, Beltrán batted .435 with 14 RBIs and 21 runs scored. A quadriceps injury bothered him most of the 2005 season and limited his speed. In 582 at bats, Beltrán's stats included career lows in batting average (.266), home runs (16), RBIs (78), runs scored (83), and stolen bases (17). Despite the limited participation, he was still voted to his second All-Star team. Beltrán played for Puerto Rico in the 2006 World Baseball Classic, joining Carlos Delgado, Bernie Williams, Javier Vázquez, Iván Rodríguez and others on the team managed by St. Louis Cardinals third base coach José Oquendo. His 2006 season was an upgrade on his first year in New York. Boosted by 10 home runs in May, he surpassed his home run total from the previous year before the season was half over. Beltrán's performance secured him a spot in the 2006 All-Star Game, his third. Five other Mets joined him, including three as starters. Beltrán was a standout for the NL as the only batter with multiple hits, along with two stolen bases. He scored the go-ahead run that gave the National League a 2–1 lead in the third inning, though the American League won the game. He hit grand slams in consecutive games on July 16 and 18, becoming the 23rd player to do so. Another grand slam at the end of July made him only the third Met to hit three in one season. Beltrán continued to produce with a walk-off home run against the St. Louis Cardinals on August 22, off Cardinals closer Jason Isringhausen. It was Beltrán's second walk-off of the season, following a 16th-inning gamewinner against the Phillies. Beltrán's defense was also recognized during the 2006 season, as he received his first Gold Glove award. He made only two errors in 372 chances to give him a .995 fielding percentage, and recorded 13 outfield assists and six double plays. He also won a Fielding Bible Award as the top fielding center fielder in MLB. Beltrán came fourth in the National League MVP award voting, behind winner Ryan Howard, Albert Pujols, and Lance Berkman. Returning to the playoffs, Beltrán hit three home runs in the NLCS, bringing his career playoff total to 11 home runs in 22 games. However, with the bases loaded and two outs in the ninth inning of Game 7 of the NLCS against the Cardinals, Beltrán struck out looking against Adam Wainwright, ending the New York Mets season. In 2007, Beltrán hit below .230 from May to July. However, he improved in August and September, finishing with a .276 batting average and 112 RBIs. In July, he made his fourth All-Star Game appearance and upon the conclusion of the season, won his second straight Gold Glove award. In 2008, Beltrán batted .284 with 27 home runs and 112 RBI. In the final game before the All-Star game, Beltrán connected his 15th home run of the season. On August 29, Beltrán collected all five RBIs for the Mets including a grand slam with two outs in the 9th to give the Mets a 5–2 lead. The Mets would win this game 5–4. Beltrán hit the last and only Mets home run in the final regular season game at Shea Stadium (the last home run would belong to Dan Uggla). The home run was a two run shot that tied the game 2–2 against the Florida Marlins. Beltrán won his third straight Gold Glove award in the outfield for the Mets. He also won his second Fielding Bible Award as the top MLB center fielder in 2008. In the voting for the 2009 All Star Game, Beltrán was third among NL outfielders (2,812,295 votes), trailing only Ryan Braun (4,138,559) and Raúl Ibañez (4,053,355). Due to his declining defense, in 2011, Beltrán was moved from center field to right field. 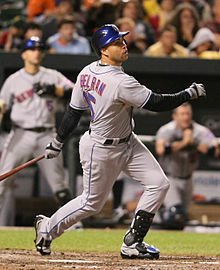 On May 12, 2011, playing against the Colorado Rockies, Beltrán hit three two-run home runs in a 9–5 Mets' victory. It was the first three-home run game of his career, and he became only the eighth Mets hitter in history to hit three home runs in a single game. On July 28, 2011, after he waived his no-trade clause, the Mets traded Beltrán to the San Francisco Giants in exchange for pitching prospect Zack Wheeler. The Mets also sent $4 million cash to the Giants to cover Beltrán's remaining $6.5 million contract, which expired at the end of the 2011 season. On April 4, 2012 Opening Day, Beltrán recorded the first-ever hit in a regular season game at Marlins Park against Josh Johnson of the Miami Marlins. Beltrán was named NL Player of the Week on May 14 after he hit .360 (9-for-25) with six home runs, 13 RBIs, eight runs, 30 total bases for a 1.200 slugging percentage and 1.648 OPS in the previous six games. He hit safely in five of the six games and homered in four of them. It was his ninth career weekly award, and sixth in the NL. On June 1, in his first game in New York after leaving the Mets, the crowd gave him a standing ovation. In one notable moment, a Beltrán batted ball touched the outside part of the foul line but was ruled a foul ball in a game in which former teammate, Johan Santana, was credited with throwing the first no-hitter in Mets' history. Two weeks later, on June 15, while batting against another former team in the Kansas City Royals, Beltrán stole second base in the second inning to become the first switch-hitter in MLB history to attain 300 home runs and 300 stolen bases, and the eighth player overall. In a June 29 home game versus the Pittsburgh Pirates, he recorded a single in the third inning for his 2,000th hit, becoming the 270th player in MLB history to do so. The day after he got his 2,000th hit, Beltrán collected his 400th double, becoming the 170th player to do so. Beltrán also participated in that year's Home Run Derby. In the 2012 National League Wild Card Game, his first postseason game since 2006, Beltrán had 1 hit in 4 at-bats, scoring a run in the 4th inning. In the NLDS against the Nationals, Beltrán went 8-18 at the plates with 2 home runs and 4 RBI. Down 5-7 in the 9th inning in game 5 of the NLDS, Beltrán hit a leadoff double off of Drew Storen, eventually scoring two outs later on a Daniel Descalso single. The Cardinals would win the game 9-7. In the 2012 National League Championship Series Beltrán batted .300 with 2 RBI and 2 stolen bases. He played in 6 of the 7 games in the series, missing most of game 3 and all of game 4 after suffering a knee injury. Playing in his 3rd NLCS game 7 in his career, Beltrán went 1-4 at the plate as the Cardinals lost 0-9 to the Giants. In 2013, Beltrán played in 145 games with a .296 batting average, 24 home runs and 84 RBI. Beltrán played in his 2,000th game on July 11, 2013. That same month, he was selected to his third straight All-Star Game. In October, Beltrán was the recipient of the Roberto Clemente Award, becoming the fourth Cardinals player to win it, joining Albert Pujols, Ozzie Smith, and Lou Brock. In the 2013 National League Division Series against the Pirates, Beltrán had 4 hits in 18 at-bats, hitting 2 home runs and 6 RBI in the series. In game 1 of the 2013 National League Championship Series against the Dodgers, Beltrán hit a double at the bottom of the 3rd inning to tie the game 2-2. At the top of the 10th inning, with the game still tied 2-2, Beltrán threw out Mark Ellis at the plate after catching a fly ball, completing a double-play that prevented the Dodgers from taking the lead. At the bottom of the 13th inning, Beltrán hit a walk-off single off of Kenley Jansen, giving the Cardinals a 3-2 victory. For the whole NLCS, Beltrán had 6 hits and 6 RBI in 21 at-bats. Cardinals won the series 4-2 to advance his first World Series in his career. In game 1 of the 2013 World Series against the Red Sox, Beltrán injured his ribs in the 2nd inning after robbing David Ortiz of a grand slam. Despite the injury, Beltrán would play in all 6 games of the series, batting .294 with 5 hits and 3 RBI as the Cardinals fell to the Red Sox four games to two. On April 13, 2014, Beltrán played at first base for the first time in his professional career after Francisco Cervelli left the game due to a hamstring injury. On the night of May 12, 2014, Beltrán experienced soreness in his right elbow. It was revealed that the elbow had a bone spur and was immediately given a cortisone shot. He was placed on the 15-day disabled list on May 15, 2014. He was activated on June 5, 2014. To prevent any further damage to the elbow, he was used primarily as a designated hitter for the remainder of the season. On September 16, 2014, Beltrán left the team for an indefinite period of time due to his wife's miscarriage. Limited to 109 games in 2014, Beltrán batted .233 with 15 home runs and 49 RBI. On October 1, 2014, he underwent surgery to remove loose pieces and a bone spur in his right elbow, which required 12 weeks to recover. The procedure was performed by Yankees head team physician, Dr. Christopher Ahmad. Beltrán got off to a slow start in 2015, batting around .200 through April. He slowly improved throughout the season and in September had a batting average over .280. On July 3, Beltrán was placed on the 15-day disabled list with an oblique injury. He was activated on July 19. On August 14 against the Blue Jays, Beltrán hit a pinch hit go-ahead 3 run homerun in the 8th inning. It proved to be the game winner and temporarily put the Yankees back in 1st place. On August 17, he had a game tying home run in the 6th against the Twins. He reached 500 career doubles on August 31 against the Boston Red Sox. Beltrán ended the regular season with 19 home runs, 67 RBIs and a .276 average in 133 games. In the 2015 American League Wild Card Game against the Astros, Beltrán had 1 hit in 4 at-bats as the Yankees fell to the Astros 3-0. On June 7, Beltrán became the 38th player all time to record 1,000 career extra base hits. He was selected to his ninth All-Star Game at Petco Park in San Diego. In a 5−3 loss to the Boston Red Sox on July 15, he became the 55th player, and fourth switch-hitter, to reach 1,500 RBIs for his career. In 99 games with the Yankees, Beltrán batted .304 with 22 home runs and 64 RBIs, leading the Yankees in all categories. On August 1, 2016, the Yankees traded Beltrán to the Texas Rangers for prospects Dillon Tate, Erik Swanson, and Nick Green. Beltrán hit his first home run for Texas on August 3 against Baltimore, also scoring his 1,500th run on the play. Towards the end of the season, Beltrán stated that he had "no plans to retire", in contrast to his statements before the season. Beltrán ended the season with a .295 average, 29 home runs and 93 RBIs in 151 games between the Yankees and Rangers. In the 2016 ALDS, Beltrán went 2-11 with 1 RBI in 3 games as the Rangers were swept by the Blue Jays 3-0. On December 3, 2016, Beltrán signed a one-year, $16 million contract to return to the Houston Astros for the 2017 season as their designated hitter. On July 17, after not having played in the field in two months, his teammates held a mock funeral for his glove. Through the end of the 2017 season, Beltrán was the all-time active major league leader in Power-Speed # (363.4), ahead of Hanley Ramírez and Ryan Braun. The Astros won 101 games and clinched the AL West division title, marking the second time in franchise history they won at least 100 games. They faced the Boston Red Sox in the best-of-five ALDS. In Game 4 on October 9, Beltrán added to his legacy of postseason success. He hit a ninth inning RBI double that proved to be the deciding run in a 5–4 victory that clinched the ALDS for the Astros. The Astros dismissed one of Beltrán's former teams, the Yankees, in the ALCS in seven games. As the Astros advanced to the World Series, it was the second of Beltrán's career, where they opposed the Los Angeles Dodgers. During the series, Beltrán registered three plate appearances over three games, going 0–3. The Astros defeated the Dodgers in seven games, making Beltrán a World Series champion at last. Beltran announced his retirement from playing on November 13. He was named winner of Sports Illustrated's inaugural Hope Award for his work in assisting Puerto Rico in the aftermath of Hurricane Maria. Beltrán batting for the Puerto Rico national team in the 2013 World Baseball Classic. Beltrán has appeared in the four editions of the World Baseball Classic (2006, 2009, 2013, 2017) for Team Puerto Rico. In the 2017 World Baseball Classic, he batted 4th in the lineup as their designated hitter. Following the conclusion of the tournament, which was won by United States upon beating Puerto Rico in the final, Beltrán was named to the 2017 All-World Baseball Classic team. Following the 2017 season, the New York Yankees' managerial position became available, for which Beltrán interviewed. The Yankees eventually selected Aaron Boone to be manager. In December 2018, the Yankees hired Beltrán as a special adviser to general manager Brian Cashman. Beltrán and his wife Jessica have two daughters and one son. Beltrán's cousin, Reymond Fuentes, is also a baseball player and also played for the Royals. Beltrán is a Christian. While sliding into second base for his 300th steal, joining the 300–300 club on June 15, 2012, a cross necklace popped out of his jersey, and after the game, he told a reporter that "all the glory" was God's. In 2004, Beltrán was one of 24 athletes who endorsed George W. Bush's reelection campaign. Since establishing his foundation, Beltrán began a fund with part of his salary, intending to establish a high school focused on developing young athletes. Construction of the Carlos Beltrán Baseball Academy began in 2009, in the municipality of Florida, Puerto Rico. Beltrán donated over $4 million to the academy, built on 20 acres (81,000 m2) of land donated by the local government. The school opened in 2011, and graduated its first class in June 2013. It accepts students between the ages of 14 to 18 years, with a curriculum that includes instruction by MLB players. ^ "Bob Ramsey - Thinking the Cards have won is premature". 101sports.com. October 11, 2012. Retrieved February 20, 2013. ^ John Autin (October 16, 2012). "Carlos Beltran is Señor Octubre". HighHeatStas.com. Retrieved October 20, 2012. ^ "Carlos Beltran: How to Make Babe Ruth Feel Inadequate - WSJ.com". Online.wsj.com. October 9, 2012. Retrieved February 20, 2013. ^ Antonio champs González (October 23, 2012). "Giants lead Cardinals 7-0 in Game 7 of NLCS". Yahoo! Sports. Retrieved October 26, 2012. ^ Red, Christian; Harper, John (January 9, 2005). "BRIGHT LIGHT, BIG CITY Why the Mets are focused on catching Beltran's shooting star". New York Daily News. Retrieved October 23, 2017. ^ Pearlman, Jeff; Cannella, Stephen (May 31, 1999). "Inside Baseball". Sports Illustrated. Retrieved October 23, 2017. ^ a b c Verducci, Tom (June 28, 2004). "Carlos Beltran Is Good To Go". Sports Illustrated. Retrieved December 16, 2017. ^ Fitzpatrick, Mike (June 11, 2009). "Mets' Beltran proud of cousin drafted in 1st round". The San Diego Union-Tribune. Retrieved October 23, 2017. ^ Murti, Sweeny (March 7, 2014). "Sweeny: Beltran Thrilled For 'Switch' To Old Mentor K-Long". WCBS-TV. Retrieved December 16, 2017. ^ a b Carlos Beltran Minor League Statistics. Baseball-Reference.com. Retrieved November 2, 2017. ^ a b c d e f g h i j k l m n Carlos Beltran Stats. Baseball-Reference.com. Retrieved November 2, 2017. ^ 1999 Kansas City Royals Batting Orders. Baseball-Reference.com. Retrieved November 4, 2017. ^ BASEBALL; Beltran Chosen Rookie of Year. Associated Press. November 10, 1999. Retrieved November 4, 2017. ^ MLB (November 24, 2014). "MLB video of last Tiger Stadium at bat". Youtube. Retrieved July 11, 2017. ^ Posnanski, Joe. Carlos Beltran, from Royals project to Paul Newman. NBC Sports. October 15, 2015. Retrieved November 4, 2017. ^ 2000 Kansas City Royals Batting Orders. Baseball-Reference.com. Retrieved November 4, 2017. ^ "Players of the Month 2004". MLB.com. Retrieved November 19, 2015. ^ Doug Tucker (June 20, 2004). "Suitors lining up for Royals' Beltran". Pittsburgh Post-Gazette. Retrieved November 19, 2015. ^ Curry, Jack. BASEBALL; Beltran Will Play, but the Question Is Where. New York Times. May 20, 2004. Retrieved November 4, 2017. ^ Dean, Rick. Royals ready to talk trade. The Capital-Journal. June 12, 2004. Retrieved November 4, 2017. ^ A's acquire Dotel; Royals get 3 prospects. Associated Press. June 28, 2004. Retrieved November 4, 2017. ^ Lukas, Paul. Trades lead to odd All-Star unis. ESPN.com. June 8, 2014. Retrieved November 4, 2017. ^ Snyder, Matt (October 21, 2015). "Daniel Murphy homers in record sixth straight postseason game". CBSSports.com. Retrieved April 9, 2016. ^ Lupica, Mike. METS GET IN OPENING REMARKS & LAST WORD. New York Daily News. January 12, 2005. Retrieved November 4, 2017. ^ Richest contracts in Mets history. Newsday.com. November 29, 2016. Retrieved November 4, 2017. ^ With $119 million deal comes stadium tour. Associated Press. January 12, 2005. Retrieved November 4, 2017. ^ "Cameron suffers fractures in collision". MLB.com. Retrieved August 8, 2008. ^ Jenkins, Lee. Violent Collision HurtsTwo Mets Outfielders. New York Times. August 12, 2005. Retrieved November 4, 2017. ^ Everson, Darren. BELTRAN'S BAT STILL MISSING BAT SLOWER TO HEAL THAN QUAD INJURY. NEW YORK DAILY NEWS. June 25, 2005. Retrieved November 4, 2017. ^ Major League Baseball's 2005 All-Star starters announced. MLB.com. July 3, 2005. Retrieved November 4, 2017. ^ Stats|World Baseball Classic. worldbaseballclassic.com. Retrieved November 4, 2017. ^ Arangure, Jorge. Lopez Finds Guidance in an Unfamiliar Face. Washington Post. March 19, 2005. November 4, 2017. ^ 2006 World Baseball Classic - Cuba vs Puerto Rico - March 15, 2006. Getty Images. Retrieved November 4, 2017. ^ Carlos Beltran 2006 Batting Gamelogs. Baseball-Reference.com Retrieved November 4, 2017. ^ "July 11, 2006, All-Star Game Play-By-Play and Box Score". Baseball-Reference.com. Retrieved February 21, 2015. ^ Beltran and Mets Slam the Reds, 8-3. LA Times. July 19, 2006. Retrieved November 4, 2017. ^ Beltran, Mets tie records for grand slams in month. Associated Press. July 31, 2006. Retrieved November 4, 2017. ^ STL@NYM: Beltran blasts a walk-off two-run homer. MLB Youtube Channel. Retrieved November 4, 2017. ^ Botte, Peter. BELTRAN SHOT IS SWEET IN 16. Carlos' HR sparks Mets in marathon. NY Daily News. May 24, 2006. Retrieved November 4, 2017. ^ Schreiber, Jay. Known for Their Pitching, Mets Lead the Majors in Home Runs. New York Times. May 9, 2017. Retrieved November 4, 2017. ^ New York Mets Top 10 Single-Season Batting Leaders. Baseball-Reference.com. Retrieved November 4, 2017. ^ 2006 Louisville Slugger Silver Slugger teams announced. MLB.com. November 11, 2006. Retrieved November 4, 2017. ^ "2006 Major League Baseball Baserunning/Misc". Baseball-Reference.com. 2011. Retrieved July 29, 2011. ^ Howard beats out Pujols to win NL MVP award. Associated Press. November 22, 2006. Retrieved November 4, 2017. ^ Kepner, Tyler. Beltran’s One Wish Ignores That Strikeout. NY Times. June 1, 2012. Retrieved November 4, 2017. ^ Goold, Derrick. 10 years ago, Wainwright threw the curve that froze New York. St. Louis Post-Dispatch . October 19, 2016. Retrieved November 4, 2017. ^ Carlos Beltran 2007 Batting Gamelogs. Baseball-Reference.com. Retrieved November 4, 2017. ^ "Mets siguen imparables". Primera Hora (in Spanish). July 14, 2008. Retrieved July 14, 2008. ^ "Palote de Beltrán". Primera Hora (in Spanish). August 30, 2008. Retrieved September 1, 2008. ^ Mets Lose Final Game At Shea. Queens Gazette. October 1, 2008. Retrieved November 4, 2017. ^ DiComo, Anthony (April 24, 2009). "Beltran picks up 1,000th career RBI". MLB.com. Retrieved July 29, 2011. ^ Sherman, Brad (July 5, 2009). "Victorino on All-Star 'Final Vote' ballot". The Maui News. Retrieved July 29, 2011. ^ Noble, Marty (January 14, 2010). "Beltran undergoes surgery on right knee". MLB.com. Retrieved July 29, 2011. ^ Costa, Brian (January 14, 2010). "NY Mets 'disappointed' with Carlos Beltran for having surgery without their consent". New Jersey On-Line. Retrieved July 29, 2011. ^ Botte, Peter; McCarron, Anthony (January 14, 2010). "Carlos Beltran said New York Mets GM Omar Minaya knew about knee surgery in advance". Daily News. New York. ^ Brennan, Sean (July 11, 2010). "Carlos Beltran to return to New York Mets lineup Thursday, will hit cleanup and start in centerfield". Daily News. New York. ^ Waldstein, David. Beltran Makes a Move the Mets Were Hoping For. New York Times. February 28, 2011. Retrieved November 4, 2017. ^ Keh, Andrew (July 27, 2011). "Beltrán All but Gone to the Giants". The New York Times. Retrieved July 29, 2011. ^ Schulman, Henry (July 29, 2011). "Carlos Beltrán in fold, gets Bruce Bochy's No. 15". San Francisco Chronicle. Retrieved July 29, 2011. ^ Sullivan, Jeff. Carlos Beltran Trade Accepted; Giants Send Zack Wheeler To Met. SBNation.com. July 28, 2011. Retrieved November 4, 2017. ^ a b Carlos Beltran 2011 Batting Gamelogs. Baseball-Reference.com. Retrieved November 4, 2017. ^ Mccauley, Janie. Latos gives up 2 homers to Beltran in Padres' loss. September 14, 2011. Retrieved November 4, 2017. ^ Center, Bill. Giants complete sweep of punchless Padres. San Diego Union Tribune. September 14, 2011. Retrieved November 4, 2017. ^ Leach, Matthew (December 22, 2011). "Carlos Beltrán reaches two-year deal with Cardinals". MLB.com. ^ STL@MIA: Beltran records first hit at Marlins Park. MLB Youtube Channel. Retrieved November 4, 2017. ^ Nowak, Joey (May 14, 2012). "Red-hot Beltran named NL Player of Week". MLB.com. Cardinals.MLB.com. ^ Miller, Steven (June 1, 2012). "Beltran remembers his time with Mets fondly". MLB.com. Cardinals.MLB.com. Retrieved June 2, 2012. ^ Langosch, Jenifer (June 1, 2012). "Cardinals fall victim to first Mets no-hitter". MLB.com. Retrieved June 2, 2012. ^ Still, Mike (June 15, 2012). "Beltran is first switch-hitter with 300 HRs, SBs: Outfielder stole second base in second inning on Friday". m.Cardinals.MLB.com. Retrieved December 8, 2017. ^ Langosch, Jenifer (June 30, 2012). "Beltran's 2,000th hit an RBI single". MLB.com. Retrieved November 4, 2017. ^ Hummel, Rick (July 9, 2012). "Beltran swinging for Derby history". St. Louis Post-Dispatch. Retrieved November 4, 2017. ^ Snyder, Matt. 2012 Home Run Derby. July 9, 2012. Retrieved November 4, 2017. ^ a b WFAN staff (June 18, 2012). "Wright, Piazza headline Mets All-Time Team; Davey over Gil?". CBS New York. Retrieved July 17, 2016. ^ 2012 National League Wild Card (NLWC) Game 1, Cardinals at Braves, October 5. Baseball-Reference.com Retrieved November 4, 2017. ^ a b Crouse, Karen. 3 Up and 3 Down: Beltran Fails in the N.L.C.S. Again. October 23, 2012. Retrieved November 5, 2017. ^ Kilgore, Adam. Washington Nationals lose, 9-7; St. Louis Cardinals advance to NLCS. Washington Post. October 13, 2012. Retrieved November 4, 2017. ^ 2012 NLCS. Baseball-Reference.com. Retrieved November 5, 2017. ^ Rosencrans, C. NLCS Game 5: Carlos Beltran returns, rain not expected to. CBS Sports. October 19, 2012. Retrieved November 5, 2017. ^ "GAME INFORMATION" (PDF). St. Louis Cardinals. July 12, 2013. p. 1. ^ Goold, Derrick. Five Cardinals selected for All-Star Game. St. Louis Post-Dispatch. July 6, 2013. Retrieved November 4, 2017. ^ Newman, Mark (October 26, 2013). "Fellow Puerto Rican Beltran presented Clemente Award: Cardinals outfielder honored for extensive community involvement". MLB.com. ^ 2013 NL Division Series - Cardinals vs. Pirates. Baseball-Reference.com. Retrieved November 5, 2017. ^ Stark, Jayson. Carlos Beltran does it again. ESPN.com. October 12, 2013. Retrieved November 4, 2017. ^ 2013 National League Championship Series (NLCS) Game 1, Dodgers at Cardinals, October 11. Baseball-Reference.com. Retrieved November 5, 2017. ^ 2013 NLCS. Baseball-Reference.com. Retrieved November 5, 2017. ^ Knisley, Michael. Carlos Beltran finally Series-bound. ESPN.com. October 19, 2013. Retrieved November 5, 2017. ^ Lee, Tony. Carlos Beltran (ribs) day to day. ESPN.com. October 24, 2013. Retrieved November 5, 2017. ^ 2013 World Series. Baseball-Reference.com. Retrieved November 5, 2017. ^ "Now a free agent, Beltran's future with Cards uncertain". MLB.com. October 31, 2013. ^ "MLB Trade Rumors predicts Carlos Beltran, Grant Balfour, A.J. Pierzynski, Ervin Santana to sign with New York Yankees". ^ "Carlos Beltran turns down St.Louis Cardinals; Could New York Yankees now be in his sights?". sportsmedia101.com. November 9, 2013. ^ "Sources: Beltran, Yanks reach 3-year deal". Retrieved July 25, 2016. ^ Casella, Paul (December 20, 2013). "Yankees fan growing up, Beltran dons pinstripes". MLB.com. Retrieved December 20, 2013. ^ Marchand, Andrew (December 20, 2013). "Carlos Beltrán joins Yankees". ESPN.com. Retrieved December 20, 2013. ^ Baumbach, Jim. Carlos Beltran gets first taste of first base. Newsday.com. April 14, 2014. Retrieved November 5, 2017. ^ Castillo, Jorge. Carlos Beltran given cortisone shot for bone spur in right elbow; surgery a possibility. The Star Ledger. May 13, 2014. Retrieved November 5, 2017. ^ Hampl, Alex. New York Yankees place Carlos Beltran on 15-day DL. Sports Illustrated. May 15, 2014. Retrieved November 5, 2017. ^ Gleeman, Aaron. Carlos Beltran can’t throw, so he’s a designated hitter only. NBC Sports. June 25, 2014. Retrieved November 5, 2017. ^ Yankees Outfielder Carlos Beltran Undergoes Elbow Surgery. CBS New York. September 30, 2014. Retrieved November 5, 2017. ^ Carlos Beltran 2015 Batting Gamelogs. Baseball-Reference.com. Retrieved November 5, 2017. ^ Martin, Dan (July 3, 2015). "Yankees place Carlos Beltran on 15-day DL with oblique strain". New York Post. Retrieved July 5, 2017. ^ "Yanks demote Rob Refsnyder, activate Carlos Beltran from DL". ABC7 New York. July 19, 2015. Retrieved July 5, 2017. ^ Kuty, Brendan. WATCH: Carlos Beltran's pinch-hit home run stuns Toronto Blue Jays for Yankees. NJ.com. August 14, 2015. Retrieved November 5, 2017. ^ Criscola, Robert. Yankees' Carlos Beltran completes amazing month of August. Metro.us. September 1, 2015. Retrieved November 5, 2017. ^ Hoch, Brian; Browne, Ian (September 1, 2015). "Machi thwarts rally as Sox upend Yanks". MLB.com. Retrieved May 15, 2016. ^ a b c "Carlos Beltran » Statistics » Batting | FanGraphs Baseball". www.fangraphs.com. Retrieved July 5, 2017. ^ 2015 Wild Card Game. Baseball-Reference.com. Retrieved November 5, 2017. ^ Caldera, Pete (April 28, 2016). "Yankees notes: milestone for Carlos Beltrán". NorthJersey.com. Retrieved April 30, 2016. ^ a b SI Wire (May 15, 2016). "Watch: Yankees' Carlos Beltran hits 400th home run". Sports Illustrated. Retrieved May 15, 2016. ^ Darcy, Kieran (May 15, 2016). "Carlos Beltran third Puerto Rico-born player to hit 400 home runs". ESPN.com. Retrieved May 15, 2016. ^ a b Hoch, Bryan (May 28, 2016). "Beltran goes deep for 2,500th career hit: Outfielder just 4th Puerto-Rican born player to reach milestone". MLB.com. Retrieved May 28, 2016. ^ a b Popper, Daniel (June 8, 2016). "Beltrán records 1,000th career extra base hit". New York Daily News. Retrieved June 8, 2016. ^ a b Bloom, Barry M. (July 12, 2016). "At 39, Beltran 'blessed' to be AL All-Star". MLB.com. Retrieved July 17, 2016. ^ a b Robinson, Sam (July 15, 2016). "Carlos Beltran joins exclusive RBI club". Today's Knuckleball. Retrieved July 17, 2016. ^ Sullivan, T. R. (August 1, 2016). "Rangers get Beltran from Yanks for prospects: New York receives pitcher Tate, no. 4 overall draft pick in 2015". MLB.com. Retrieved August 1, 2016. ^ Baillargeon, Ryan (August 3, 2016). "Beltran brings power surge to Texas: Veteran slugger, who hit first homer as a Ranger, has found new life this year as DH". MLB.com. Retrieved August 6, 2016. ^ "Carlos Beltran 'no plans to retire'". MLB Daily Dish. Retrieved July 10, 2017. ^ 2016 AL Division Series. Baseball-Reference.com Retrieved November 5, 2017. ^ McTaggart, Brian (December 3, 2016). "Astros, Carlos Beltran finalize 1-year deal". MLB.com. Retrieved December 28, 2017. ^ Kleinschmidt, Jessica; McTaggart, Brian (July 17, 2017). "Carlos Beltran has spent most of the season at DH, so the Astros held a funeral for his glove". MLB.com. Retrieved July 19, 2017. ^ Walker, Ben (November 1, 2017). "Houston Astros clinch their first World Series, defeating Dodgers 5–1". Time. Associated Press. Retrieved December 28, 2017. ^ Golen, Jimmy (October 9, 2017). "Astros beat Red Sox 5–4 in Game 4, advance to ALCS". The Boston Globe. Associated Press. Retrieved December 28, 2017. ^ 2017 World Series. Baseball-Reference.com. Retrieved November 2, 2017. ^ McTaggart, Brian; Gurnick, Ken. "Houston Astros win 2017 World Series". MLB.com. Retrieved November 2, 2017. ^ Beltrán, Carlos (November 13, 2017). "Muchas Gracias, Béisbol". Players Tribune. Retrieved November 13, 2017. ^ "Carlos Beltran announces retirement after 20 seasons". MLB.com. Retrieved November 13, 2017. ^ Kolur, Nihal (November 29, 2017). "Carlos Beltran wins Sports Illustrated's Hope Award". Sports Illustrated. Retrieved December 9, 2017. ^ Witz, Billy (November 27, 2017). "Carlos Beltran tips cap to the Mets in interview with the Yankees". The New York Times. Retrieved December 28, 2017. ^ Martin, Dan (December 4, 2017). "Yankees give their Aaron Boone reasoning, now that it's official". New York Post. Retrieved December 28, 2017. ^ Acquavella, Katherine (December 18, 2018). "Carlos Beltran reportedly joining Yankees' front office as special adviser to GM". CBSSports.com. Retrieved December 19, 2018. ^ "Cardinals outfielder Carlos Beltran is first switch-hitter with 300 homers and stolen bases | cardinals.com: News". St Louis Cardinals. MLB. Retrieved February 20, 2013. ^ "Athletes Endorse Bush -10/21/04". Retrieved July 25, 2016. ^ a b c "En plena construcción la Carlos Beltrán Baseball Academy". El Vocero (in Spanish). November 13, 2009. Archived from the original on November 15, 2009. Retrieved November 16, 2009. ^ Sanchez, Jesse (February 7, 2011). "Beltran's academy offers hope for youths". MLB.com. ^ Feinsand, Mark (March 10, 2014). "Yankees' Carlos Beltran named spokesman for MLB's school teacher initiative". New York Daily News. ^ "Kansas City Royals Player of the Year". Baseball Almanac. Retrieved July 17, 2016. ^ "Outstanding Rookie of the Year Award". Baseball Almanac. Retrieved July 17, 2016. This page was last edited on 15 February 2019, at 03:30 (UTC).